I think it is time for a Gus update! The little guy is doing well - he now weighs a hefty 6 pounds and is as active as ever. Whether it is running around with a sock he stole from the laundry basket or chasing after the big fluffy white thing (as he likes to call Max) to show his love, he is making sure we stay busy! He gets everything he wants too (well, almost!)... 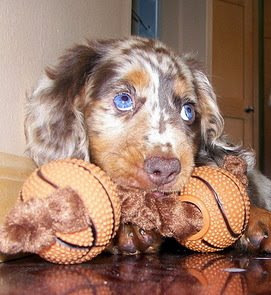 I think it is darn near impossible to say no to a look like this! We finished out the week with 8 new recipes - our tops this time were that Tortilla and Black-Bean Pie, the Malted Milk Black and White Pound Cake and the Cheeseburger Pizza from Friday night. Sharper, but not as sweet as Swiss cheese, Gruyère is one of those ingredients that you'll often find in our refrigerator if you peeked inside. We used a hunk of that cheese to star in tonight's Creamy Potato Casserole we had for dinner. 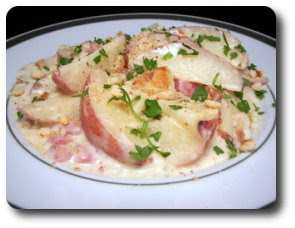 For this casserole, the first order of business is preparing a creamy sauce that the potatoes will bake in. Once a chopped onion had softened in a couple knobs of butter, we added a bit of flour and a few dollops of tangy Dijon mustard. So you don't end up with a sauce that tastes like flour, stir this combination in the pot for a minute or so to give that flavor a chance to cook out. This mixture will then begin to thicken the milk that is added next. 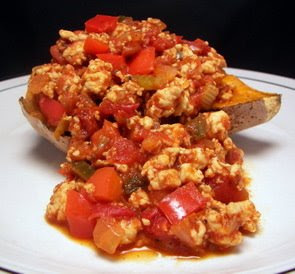 Cubes of cream cheese are dropped in to slowly dissolve, adding a wonderful body to this sauce. When the mixture smooths out, shreds of the Gruyère cheese are allowed to melt in, followed by a spoonful of chopped chives. 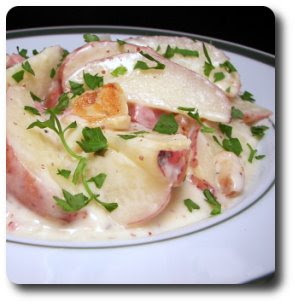 The silky sauce is then tossed together with thin wedges of red potatoes and chunky pieces of chopped ham. Baked, covered, until the potatoes are tender, the dish is then given a light stir and topped with a bit more Gruyère along with crumbles of garlicky bagel chips. The dish is then baked again just long enough to give the cheese a chance to melt and allow the bagel chips to take on a little color. When I took it out this time, I found it to be still quite saucy dish - I don't know if it should have been, but neither of us minded as it was delicious! With it being so saucy though, I had a problem keeping those crunchy bits of bagel chips on top of the actual serving. So, I just sprinkled a bit more crushed on top. The potatoes were fork tender, yet still held their shape well through plating and those chunky cubes of ham finished off the dish with a hearty one-dish feel. Jeff also commented that the tangy bite from the mustard helped to round out the flavor of the creamy sauce. 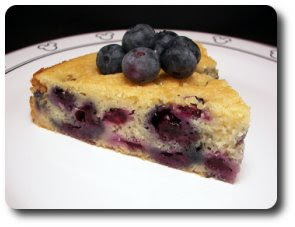 This lighter coffee cake is studded with those fresh, plump berries and was exceptionally moist - however, I thought it was almost on the verge of being too moist! When I was preparing the vanilla batter, there didn't seem to be anything unusual, but after I added the cup of buttermilk, I thought in my head that it looked just thick enough. While the recipe called for another 1/3 cup of buttermilk, I held back and compromised by tossing in two tablespoons instead. The cake read like it was going to be a bit delicate, so rather than fuss with trying to get it out of a cake pan, I used a 9" springform pan instead (if you do use a 9" cake pan, you may need to increase the baking time slightly). 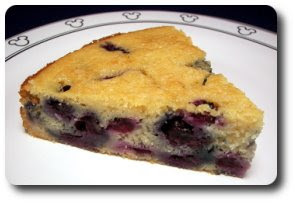 Rather than mixing the batter with the blueberries, half of it is spread into the pan followed by a layer of berries, the rest of the batter and the other half of the berries. Just for added insurance against the berries wanting to sink, I tossed them with a couple teaspoons of flour to help suspend them in the batter. To give the cake a bit of sparkle and crunch, the top is scattered with coarse turbinado sugar right before going into the oven. The flavor was right on and not too sweet - but, I thought the texture would have been a little better if I stuck with my instincts and left the buttermilk at 1 cup. It wasn't bad by any stretch of the imagination as we both enjoyed it - I just thought the cake was almost a little custard-y near the bottom (which I don't think would have been solved by baking longer as the crumb was not exceedingly wet). I think we need to start a pizza dance around here - another Friday is upon us and I'm having a blast trying to keep this new Friday Night Pizza tradition(!) alive. 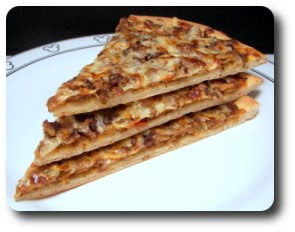 Unlike the last couple of pizzas, this one is pretty straight-forward without any unusual combinations - in fact, just the name alone of this Cheeseburger Pizza had Jeff drooling (though I think all you'd have to do is mention cheese and that would happen!). If you would like a thinner crust to your pizza, use the 12-ounce version of our favorite whole-wheat dough; if you prefer a heftier crust, go for the 16-ouncer and just roll it out to the same diameter. On top of the stretched out dough, we spread a thin layer of marinara (or you could use your favorite pizza sauce) to start us off. On top of the sauce, we scattered crumbles of lean ground sirloin that we cooked along with a chopped onion, a few cloves of pungent minced garlic and a pinch of dried oregano. While I'm sure you could shower the top with just one cheese, why not mix a couple? 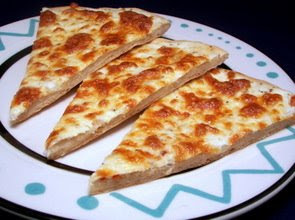 On this pizza, we finished it off with sharp White cheddar and creamy mozzarella cheese for an extra boost of flavor. 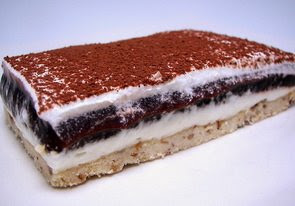 Needless to say, it is hard to go wrong with this combination and we were stuffed with a smile on our faces by the time we finished our slices. Feel like shaking it up? How about switching out half of the ground sirloin with a spicy Italian sausage? 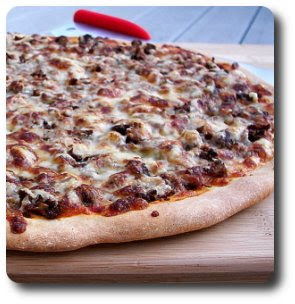 Or if your feeling a little naughty, crisp up some bacon and toss it into the mix for a bacon-cheeseburger pizza! We are often doing dinners around here that don't take a bunch of time to prepare. 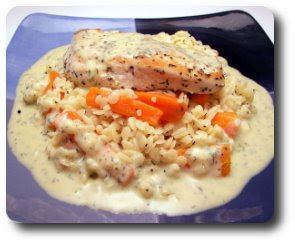 I knew I needed tonight's dinner to be not very fussy as it was to be a fairly busy day, so I picked this fancy named, but a snap to prepare, Chicken Breasts with Orzo, Carrots, Dill and Avgolemono Sauce dish. As I was sautéing individual boneless and skinless chicken breasts, simply seasoned with salt and fresh ground black pepper, I made sure the other burner on the stove was busy bringing a pot of water to a boil. When the chicken had turned golden on the first side, we flipped them over, poured in a layer of broth and sprinkled the skillet with dill. Partially covered, we let the chicken bubble away to finish cooking through as I dropped a good amount of orzo pasta into the boiling water. As an aside... When we went to the market this weekend to pick up the orzo for this dish, I couldn't find the brand we usually use - the only other one in stock was from DaVinci and it looked a little curious to me. While I've always seen orzo as more of a rice-shaped pasta, this was flat and more like a tear drop! A few minutes before the pasta was ready, I dropped sticks (not too thin or thick) of fresh carrots into the pot of pasta and let the duo finishing cooking together. Once drained, we tossed the two with olive oil to keep the pasta from clumping and to add a bit of flavor. When the chicken was firm to the touch and done, we set the chicken aside to keep warm and then went to work on creating the Avgolemono Sauce. Basically, this is a Greek sauce (or can also be turned into a soup) that starts off by whisking together eggs and fresh lemon juice. Warmed broth is whisked into the two, tempering the eggs, before being added back into the pan which tightens up the loose liquid into a bright, luscious sauce. Be sure to keep the pan over fairly low heat - you want just enough oomph to thicken the mixture, but not so much you make scrambled eggs! Served by setting a moist chicken breast atop a bed of the orzo and the crisp-tender carrot planks, the generous lemon-y sauce, with its green flecks from the dill, is streamed all over the top and around the sides. While it may look like a bit too much sauce, we both couldn't get enough and were practically licking (I'll admit it... we did!) the plates to not waste any drops left behind! Pretty healthy as is, you could even sneak in a bit of fiber by using whole wheat orzo if you can find it! We don't drink much alcohol... in fact, I couldn't even tell you the last time I actually drank some from a glass. However, that doesn't mean our pantry is void of any as I actually use quite a bit for cooking (surprise!). 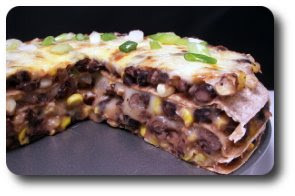 I bring this up because I had to pop open a bottle of beer to make this Tortilla and Black-Bean Pie for dinner tonight. It was kind of funny - I had it sitting on the counter when Jeff came walked in the door and said "Hey! Why wasn't I invited to the party?". Jeff wanted to go try out a sip from the bottle, but sadly there was nary a drip left when he turned the bottle upside down... oops! The filling for this stacked pie is a combination of softened onions, a jalapeño chile (feel free to remove the ribs and seeds from the inside if you want to tame the heat), a couple cloves of garlic and a bit of cumin for a smoky background. A few cups of black beans are added, along with the beer, and the mixture is allowed to simmer until the liquid has mostly evaporated, infusing the beans with flavor. I then stirred in a bunch of corn kernels (I knew I couldn't keep myself out of the supply in the freezer!) and a few sliced scallion to heat through. The original recipe called for using 10" flour tortillas and then trimming them down to fit inside a 9" springform pan. Rather than go through the trouble, I just used 8" tortillas - the bean layer was a bit thicker, but not unmanageable at all! The assembly process is very straight forward - the round tortilla is placed inside the springform pan, followed by a mound of the chunky bean mixture and a scattering of white cheddar cheese. 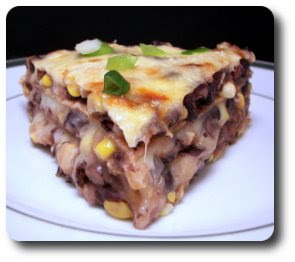 The layers continue, ending with the beans on top and a generous layer of cheese as the final touch. This needs to bake just long enough so the filling heats back up and the cheese turns from shreds into a gooey, stringy mess of cheesy love. I really didn't find the need to use a springform pan in the end, especially if you are using the smaller tortillas, however it is a good safety measure "just in case" anything should happen when transferring it in and out of the oven. After a short rest, I found this was completely slice-able into fairly neat and tidy pieces, save for the bit of the warm cheese the slowly oozes out. Hearty, very filling and did I mention cheesy? How could you go wrong with this? If you're feeling festive, top it off with a dollop of cooling sour cream and a spoonful of your favorite salsa! Boy, do we have a fun cake to share with you today - for the Weekly Wednesday Treat Day, we went all out and prepared this monster Malted Milk Black and White Pound Cake! It's hard to go wrong when you use this much butter and sugar while working in malted milk powder and chocolate syrup into the mix! This cake has a very tender crumb from the use of cake flour - if you take it upon yourself to make this cake, do yourself a favor and pick up some cake flour for the best delicate texture. When you're mixing together the batter, take note of the time needed to incorporate all of the ingredients. You need plenty of time to beat air into the butter, sugar and 7, yes count that 7, eggs because there really isn't much leavening in the form of baking powder or baking soda. Also, be sure that the butter is soft, yet not meltingly so (the sticks should have a slight bend to them, but they shouldn't be so soft that they are very squishy) and that the eggs are at room temperature. If you want to completely geek out a bit, I find that the butter incorporates best when it is around 66 to 68 degrees. When the light and billowy pale malted cake batter has been combined, about half of it is scooped out to be put into the tube pan while the rest is given a few wicked additions in the form of rich chocolate syrup, a few drops of almonds extract and just a sprinkle of baking soda. Pour this milk chocolate-colored batter right on top of the lighter batter already in the baking pan, but don't swirl them together - just spread the top smooth and place into the oven. 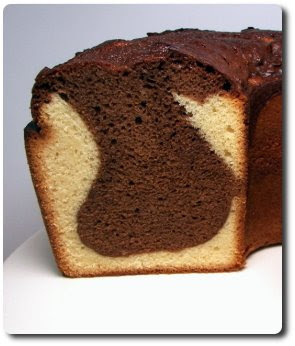 As it bakes, the now heavier chocolate batter will slowly be enveloped by the plain batter to create a surprise when you slice into the cake. 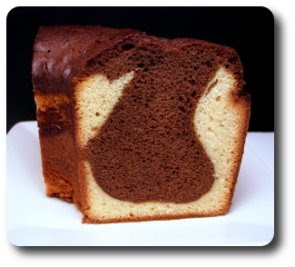 Being a pound cake, it is fairly dense, but not in a concrete sense - it is still moist, tender and the (several) eggs gave it a wonder lift. I do have to say that the malt flavor is fairly mild, but we both could easily detect it and it certainly gave the cake an alluring quality. 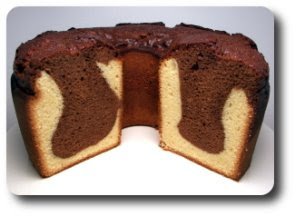 The darker layer was not too intense, so it didn't fight with the plain batter, but it had just enough chocolate to satisfy any craving. Once completely cool, try your hardest to resist the urge to slice into it - let it stand several hours, covered, so the flavors inside have a chance to bloom to make this cake shine. Knowing that we were going to be indulging in this cake (well, I couldn't send something in unless we tried it first just to make sure!) tonight, I figured it was best to keep dinner on the lighter side. 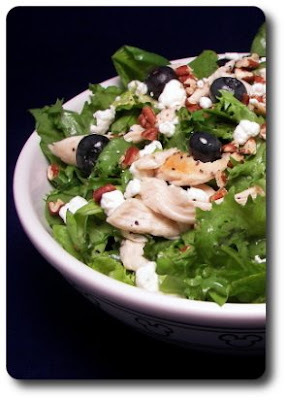 We had picked up some fresh blueberries this past weekend at the market so I tossed together this snazzy Chicken, Endive and Blueberry Salad with Toasted Pecans. So, this salad was originally supposed to be made with Belgian endive - you'll find this green as a cylindrical head with tightly packed leaves. I needed Jeff to pick this up today and I guess I should have described it a bit more as he actually came home with curly endive! Not his fault as the store didn't have it labeled right, but it does have a different flavor and texture - a bit more bitter and not as crisp. Rather than wasting a trip to the store to pick up the other endive, we just went ahead as both of us actually like a bitter green. To coat this salad, a dressing made simply of pucker-y apple cider vinegar and sweet, sticky honey is whisked together and lightly seasoned with salt and pepper. 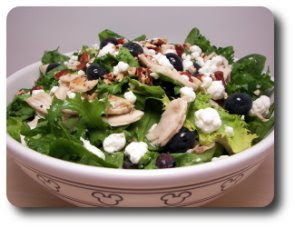 I prepared that dressing in a big 'ol sturdy salad bowl and then added the chopped endive, tender baby spinach leaves, a couple shredded chicken breasts and a handful of fresh blueberries. This saves a step from the original recipe that has you whisk the dressing in a separate small bowl to drizzle on after the greens are combined. To round out the salad, tangy crumbles of goat cheese are scattered on top along with a few chopped and toasted pecans for a nutty crunch. You could probably stretch this out to four portions if serving this as side, but we divvied it out into two servings for a very filling, but light, dinner. With the sweet and tart dressing, the bitterness of the curly endive was easily tempered - I also surprisingly enjoyed just how well the fresh blueberries paired the creamy goat cheese! We breezed through the week with 9 new recipes - our tops this time were those Mini Banana Whoopie Pies, Chicken Sloppy Joe on Sweet Potatoes and the Mexican Pizza from Friday night. 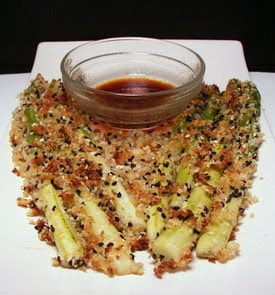 For our side dish tonight, I chose an intriguing way to perk up thick spears of asparagus in this Roasted Sesame and Panko-Coated Asparagus with Soy-Ginger Drizzle recipe. You do want to use the thickest asparagus spears you can find because the thinner ones just won't hold up well to the coating and roasting. Because the thicker ones can be a little woody, the spears are trimmed and then the bottom two-thirds are peeled. They are then generously coated in a mixture of mayonnaise, rice vinegar, soy sauce and fresh ginger - you should have seen Jeff's face when I plunked the long spears into this glutinous mixture... priceless! His only comment "Err, are you sure you read the recipe correctly?". I retorted with "How about you go play with Gus and let me handle dinner?". Hee hee! The well-coated spears are then rolled in a coarse speckled mixture of panko bread crumbs, regular sesame seeds and black sesame seeds. You can use regular sesame seeds entirely, but I like the pop of color and slightly earthier flavor the black seeds have. 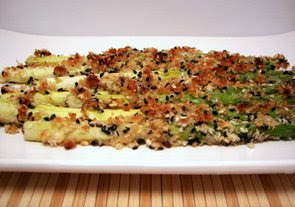 The asparagus are then nestled on a baking sheet and given a drizzle with pungent toasted sesame oil. While they looked to have enough flavor as is, a sweet, salty, sour and slightly hot sauce is combined by whisking together brown sugar, soy sauce, rice vinegar, a couple squirts of chili-garlic sauce and a touch of that rich toasted sesame oil. Since we needed to take the picture, I decided to serve the sauce in a little dish so the crispy-coated asparagus wouldn't get soggy during that process - I recommend that you may want to do they same just so you or your guests can determine how much of that intense drizzle to add. The asparagus was tender with a slight bend, yet not too soft and mushy - the sesame and fresh ginger combination did not disappoint and that panko coating added such a fun new dimension with its golden color and crunchy texture. While that asparagus dish did have a bit of prep and assembly work to be done, the protein portion of our dinner tonight, Spicy Apricot-Glazed Chicken, had a minimal 5 ingredient list, which includes salt and fresh ground black pepper in the total! 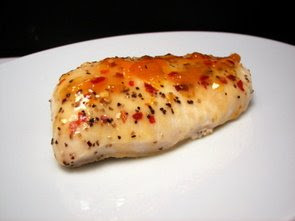 All you need to do for this dish is season a few chicken breasts, set them under a broiler and halfway through brush them with a fruity glaze consisting of apricot jam and crushed red pepper. How easy is that? Because of the higher sugar content in the jam, stick with adding the shiny glaze at the half-point mark so it doesn't burn under the intense heat of the broiler. Slightly sweet, while staying juicy and tender, this really isn't much of a recipe I guess. However, I have a feeling we'll be making this often when I'm testing out a new side and we need to serve a solid, but simple and quick-to-prepare protein dish. 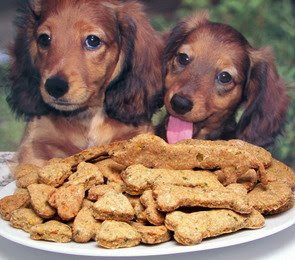 Time for more homemade doggie treats! Max had finally finished the last of those Banana-Carob "Pup"scotti I made a few weeks ago just before we got Gus... I've been waiting to find some time to make a new treat recipe for both of them and today was it. Woo! 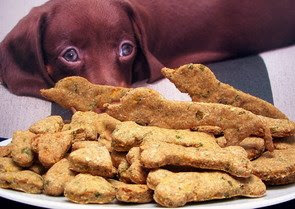 I knew I wanted a treat I could split up into smaller pieces for the pup and larger ones for Max, so here is what I came up with - Crunchy Parsley and Carrot Biscuits! And no, we didn't get more pups! 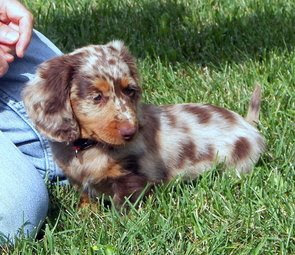 Those are from a calender we got last year of little daschunds! I like to use a variety of dry ingredients when I'm making treats for them - this time in addition to the regular whole-wheat flour I always start out with, I added brown rice flour, cornmeal and a touch of oat bran. Now for the fun stuff! I chopped up a bunch of fresh parsley (I can only hope it might freshen up their breath too... hee hee!) and shredded up a carrot to add in. Since I've learned in the past that Max loves cheesy treats, I also added just a bit of shredded cheddar cheese to entice them. To bring all of these ingredients together, I added enough vegetable broth to form a workable dough (you could use beef or chicken if you wanted... water would be fine as well) and a couple tablespoons of canola oil for texture and a little healthy fat. I used a tiny heart-shaped cutter for Gus's snacks while I used the larger bone-shaped one for Max. And just because we already had the cutter, I also made some little dachshund-shaped biscuits... however, thinking about it now, I don't think we'll give those to Gus as that seems wrong! Max will have to get them I guess, but we'll have to make sure Gus isn't watching! The baking powder in the dough will make them puff up a little, but you can fit the biscuits fairly close together on the baking sheet and not worry about them as they don't spread much. Make sure to bake them until they are golden and firm to the touch - it is okay if the center is slightly soft though as they will continue to crisp up as they cool. I didn't know if they would reject these or not with the carrots and parsley, but Max gobbled his up in record time while Gus was a little timid. However, once he took a taste, his little heart biscuit didn't last long! Another Friday night has arrived and you bet that we did another pizza! I hope I can keep this up each week as it is sure a treat to try out all these different types. For this week's pizza, we went south of the border and prepared this Mexican Pizza. The original recipe had you prepare the ingredients in a bit different order, but I changed them around as we thought it would work better for us. After I prepared our favorite whole-wheat pizza dough (which you really should try if you haven't yet! ), I turned on the broiler to blister and blacken a poblano chile. You are doing this to give the chile a charred flavor, but it is also a good way to get rid of the thick skin. Poblanos are usually a mild chile, but I've found it can be hit or miss - sometimes they are darn hot and other times they just provide good flavor (and lucky for us we got a mild one this time!). Once the chile has rested, loosening it's now dark skin, just use your fingers to peel it off - it is fine if some black bits remain. Just don't rinse the chile under water when peeling as you would be washing all that developed flavor right down the drain! While we were waiting on the chile to cool, I reduced the oven temperature and tossed rings of a red onion onto a baking sheet, drizzled them with oil and lightly seasoned them. We let them roast until they had softened and just started to turn golden. At this point, I stretched out the smooth dough and smeared a lean layer of smoky chipotle pepper that we minced with a little of the adobo sauce it comes canned with. Chipotles are basically just smoked jalapeños stored in a vinegar-y sauce - they can be fairly spicy, but you can erase some of the heat if you scrape out the seeds... but that is pretty messy! Moving the assembly of the pizza along are strips of that blackened pepper, the roasted red onions and then a special ingredient that I never thought to use on pizza - tomatillos! Finally we finished off the top with a duo of cheeses - sharp white cheddar and crumbly queso fresco. 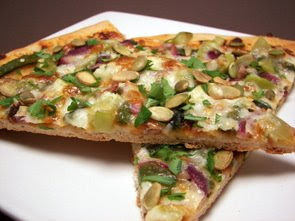 After we pulled the pizza off the burning hot stone, we sprinkled the top with fresh cilantro and a scattering of toasted pepitas (pumpkin seed kernels). Since the layer of minced chipotle was quite thin, it really didn't add an excessive heat - just enough smoky background that had a little kick. The tomatillos brought such a refreshing, citrus-y tang that I thought paired well with the mild poblano chile strips. We also both thought those pepitas were a clever addition and loved the textural crunch they brought. 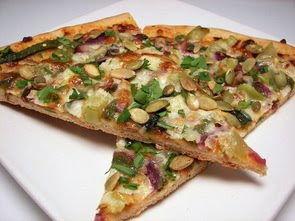 Another unusual, but delicious pizza we've devoured to add to the list! Dig out those sunflower seeds! I went back through the blog to see when the last time I made a new bread recipe during menu planning this past weekend and I couldn't believe it was way back in June when I made that sourdough loaf! I knew I had to rectify that this week, so I made sure to find time to prepare this Sunflower-Wheat Loaf. Because whole-wheat flour tends to take awhile to absorb liquid, a sponge is created first by stirring together the flour, instant yeast, salt, sweet honey, canola oil and robust molasses. This mixture sits for an hour or so - this will make the kneading process easier and allow you to add less flour since the wheat had a chance to absorb the liquid. If you don't have instant yeast, you can certainly use active dry - just dissolve it in the warm water first and let sit for a few minutes. When the sponge was ready, we stirred in bread flour, wheat germ and a little cornmeal for crunch. 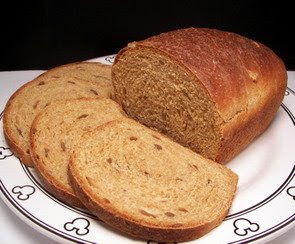 Using bread flour will help lighten the loaf so it isn't like a brick from that heavy whole-wheat. When kneading, use just enough of the extra bread flour to keep the dough from sticking to your hands - however, it shouldn't be dry either... just tacky to the touch. Once the gluten had developed from all that fun kneading, we finished the loaf off by working in a handful of sunflower seeds. Once the dough was rolled up and slid into the loaf pan, we set it aside long enough to just about double in bulk - the time for this will vary for a number of reasons... you can tell when it has risen enough when you gently push your finger into the dough and the indent remains. If it quickly fills in, the dough needs more time to rise. I know how hard it is to resist hot, homemade fresh bread, but do yourself a favor and let the baked loaf cool completely (or as long as you can) before slicing into it. Waiting allows the texture of the bread to set up and you will have a much easier time slicing it. We both had our first piece with just a light smear of butter and it was quite tasty. When we went for our next slice, we made sure to toast it first and the flavors jumped out even more! 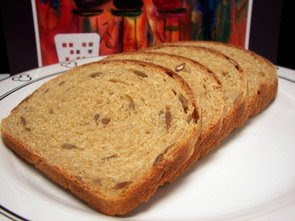 Not dense, but not as light as a regular white loaf, we thought this was an excellent compromise between the two - if you want to add a fruity component, knead in a quarter cup or so of dried fruit (apples, blueberries, apricots or raisins would be nice) when you add the sunflower seeds. Doing that would make this an excellent breakfast-type bread as it is just a little sweet from the honey added. When Jeff brought in those treats we made for treat day yesterday, I also gave him a big bunch of fresh basil I cut in the morning to share since we just have so much. 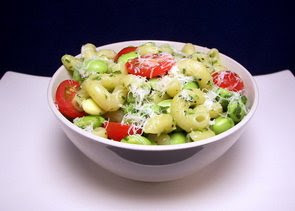 Even doing that, I still wanted to cut the plants back a bit more, so I took enough off to prepare this Edamame with Pesto and Cavatappi for our dinner tonight. The pesto is a bit different in the fact that it has no nuts or cheese added - I thought this was a bit odd, but I went ahead anyway. The pesto does get a boost in flavor by the addition of fresh mint to the basil leaves and a couple shots of fresh lemon juice. Once we had whirled that together in our trusty food processor, we dropped the corkscrew-like cavatappi into a pot of boiling salted water to start cooking. A few minutes before it was al dente, we also tossed in a few cups of edamame to cook along side (less dishes!). Do be sure to save a bit of the starchy cooking liquid before draining the pasta and green soybeans... I know if I don't do it before hand, I've forgotten and remembered as I watched it go down the drain! The pasta and edamame are then added back into the cooking pot (again, less dishes!) to be tossed with the pesto and a few halved grape tomatoes. While there was no cheese in the pesto, each serving gets a shower of sharp Parmesan cheese before serving. 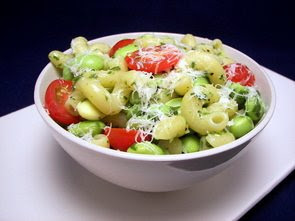 Bright, fresh and pretty hearty, I loved the grounding flavor the fiber-rich edamame brought to this dish. In my first couple of bites, I found myself looking for the richness that a few toasted nuts would have added in the pesto, but by the time I finished my plate, I didn't miss them at all! I love those homemade burger buns that we often prepare and they make for a great vehicle to serve sloppy joe's on! However, for the version of sloppy joe's I made tonight, we decided to change things up and pour the juicy meat mixture over sweet potatoes! Once we had finished cooking the ground chicken (as always, I do this at home in the food processor so I can control the texture and mix in a bit of dark meat for flavor) for this Chicken Sloppy Joe on Sweet Potatoes dish, we scooped the meat out and started softening a chopped onion, a thinly sliced stalk of celery and a few chunky pieces of sweet red bell pepper. So the spices had a chance to gently toast, we also added the chili powder, dried oregano and a pinch of cayenne pepper with the vegetables. Now, to turn the joe's sloppy (hmm... yeah that sounded odd in my head too), we stirred in a couple cups of salsa and a few splashes of tomato juice. We used a habanero salsa as Jeff craves fiery foods with abandon, but use whichever mild, medium or as hot-as-you-can-stand-it if you like. Just let it cook down for a few minutes so the flavors intensify and most of the excess liquid evaporates. You want it movin' and groovin' in the skillet, but not drowning in juices. We baked our sweet potatoes in the oven just because that's what we prefer, but if you are in a time crunch, you could always heat them in the microwave to speed things along. If you choose that method, it should take just about 8 to 12 minutes, depending on your microwave and size of the potatoes. While it was exceedingly spicy (a good burn though) from using Jeff's habanero salsa, the tender sweet potato was a perfect backdrop to help tame the heat. This was fitting as I found there was just enough of the meaty mixture and the potato to get a forkful of each without having one or the other leftover. Jeff commented that he thought a few minced cloves of garlic might have been nice to toss in with the vegetables - I agree, but I also think it would depend on the salsa you use. Even though the oven had to be on for quite some time, I had such a blast making the Weekly Wednesday Treat Day today! 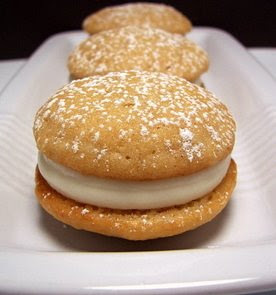 For this week's treat, I made these Mini Banana Whoopie Pies. We've made chocolate whoopie pies that had a marshmallow fluff filling, but these little pies go in a different direction. I loved the texture of the banana batter - it was thick, yet billowy and was a dream to pipe with. Besides adding a tangy background, sour cream is used in the batter to keep the small cakes very moist with quite a tender crumb. To give them the best banana flavor, you'll want to make sure you use a very ripe banana - the blacker that former yellow-y outer skin is, the sweeter and more intense the meat inside will be. One large banana should yield just enough after being mashed for this recipe. Let the cakes bake long enough so the edges take on a light golden tinge while the tops remain slightly pale - they are done when the tops spring back when slightly touched in the center. Once the myriad of rounds had cooled (we got an even 72! ), I started slathering half of them with a creamy concoction of softened cream cheese, sweet confectioners' sugar and a dash of vanilla. 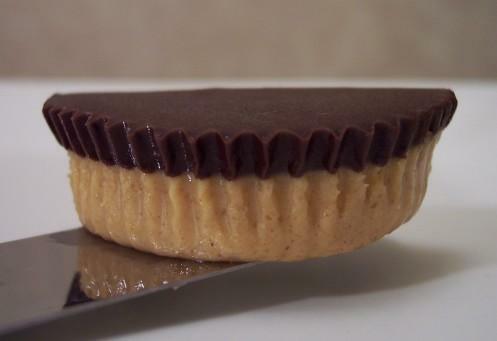 While you can spoon the filling on the cakes, you'll make your life much easier and save time if you fill up a pastry bag or even a zip-loc bag and quickly squeezing it on. 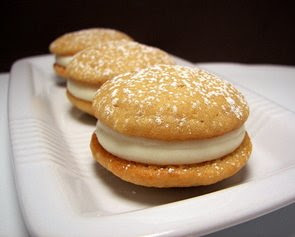 Once assembled, give the whoopie pies a dusting of confectioners' sugar before serving for a little flare (I'll do this to the rest of them tomorrow morning). 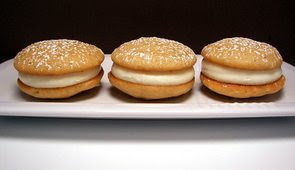 I loved the more traditional marshmallow-esque filling like we used in those other whoopie pies I mentioned earlier, but since these were much smaller, I can honestly say that we both thought this richer cream cheese filling was a good choice! The banana flavor in the cakes was nice, but I think what I really enjoyed was the depth from the combination of brown sugar and granulated sugar used for sweetness. If I would have thought about it, I would have swapped the granulated for some of the vanilla sugar I keep in a big 'ol jar in the pantry for a punch of fragrance. Tonight's dinner was dead easy... I didn't need to use any mixing or prep bowls, no cutting boards and certainly not even a knife! The only things I dirtied up was a baking dish, measuring spoon and a measuring cup to prepare this Maple-Baked Oatmeal. The best part? I didn't even need to turn on the oven as the baking dish was small enough to fit in our toaster oven - score! Old-fashioned rolled oats, lightly toasted sliced almonds, maple sugar and pure maple syrup are the base ingredients for this dish. Just lightly toss those together inside of the baking dish so they are evenly mixed - if you don't happen to have the lovely maple sugar (worth it though! ), you can always use brown sugar. 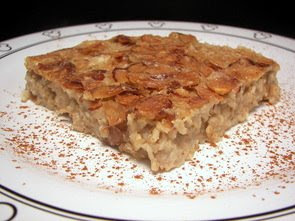 Pour in a few cups of milk and bake until the oats have softened and the milk has been absorbed. As soon as the pan comes out from the oven, dust the top with as much of your best ground cinnamon to taste - we used our favorite Vietnamese cinnamon since it is pungent, sweet and the aroma is irresistible. The texture of the baked oatmeal was soft, yet still firm enough to hold its shape while keeping a chewy quality to it - Jeff mentioned he was afraid it was going to be completely mushy, but he was quite happy with the result! The only thing I think I would do differently is to toss a couple pinches of that cinnamon right into the dry oat mixture so the flavor would have been developed more. While we both ate it as is from the pan, you could definitely pour some additional milk on your portion for a creamy aspect. We also thought it was sweet enough for us as is, but if you have a wicked sweet tooth, stream a drizzle of pure maple syrup on top for a bit of decadence. Not a fan of almonds? Dried blueberries or cranberries would make for an excellent stand-in! Well, we enjoyed a cool stretch over the last few days, but as usual around in August, the temperatures have started to shoot up again. 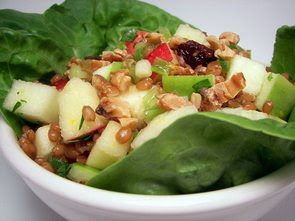 I was planning on another dish for dinner tonight, but I moved that to tomorrow so we could cool down with this Wheat Berry Waldorf Salad. Some recipes call to soak wheat berries before cooking them, but I've never found it to cut that much time off the total needed to soften the hard grains. I was glad to see this one left that step off. The wheat generally takes about an hour to an hour and a half to soften... I check at the sixty minute mark and they are usually close to being done, depending on if they are cooked at a light simmer or closer to a boil. While the tender, chewy wheat berries were cooling, I had plenty of time to knock out the preparation for the rest of the ingredients. 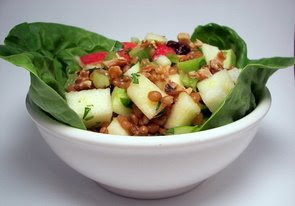 We chopped up two types of apples for this salad - Gala for their sweet, light flavor and Granny Smith for a tart, juicy bite. A thinly sliced rib of celery, dried sour cherries and plump golden raisins round out this fruity salad, adding flavor and their contrasting textures. For a nutty note, a handful of chopped walnuts that we toasted are also tossed into the mix. To keep the salad light and refreshing, we prepared a zippy dressing made of freshly squeezed juice from a sweet orange, zest from said orange and a few glugs of seasoned rice vinegar. Do note, seasoned rice vinegar is different that regular rice vinegar - the seasoned has salt and sugar added. A couple green onions lend a savory aspect, while a bit of chopped mint brought a breath of fresh (literally!) air into the salad. With all of these sweet flavors, it may seem a little odd to season at the end with salt and fresh ground black pepper, but don't skip this part as it ties the rambunctious tones together. I quite enjoyed the dried sour cherries in this dish, but I can see how you could replace them with dried cranberries if you couldn't find them (I finally located a bag at Trader Joe's). While I can appreciate the lighter nature of the dressing, we both commented that we thought a splash of a good, fruity olive oil would have been a nice accent. You certainly don't have to serve this salad with those tender Boston lettuce leaves, but it does make for a more dramatic presentation. Jeff decided to make good use of them, ala a tortilla, and making a wrap out of the salad and lettuce! Gus is officially 8 weeks old today! Woo! We had our first visit at the vet's office yesterday and he was thoroughly smothered with lots of love from everybody - I was afraid we were not going to get him back when they took him in the back to show him off! Gus still hasn't found his bark yet (and we're not complaining! 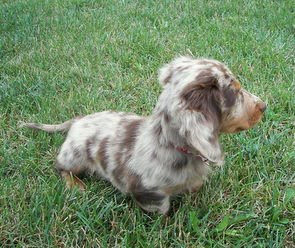 ), but I think it will be any day now before he is yappin' away. 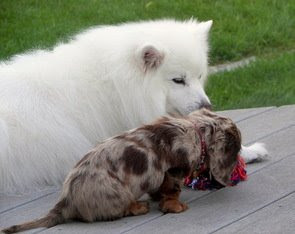 We are very happy to say that Max has really taken a liking to the little guy and they are having a blast chasing each other around. Although, Max does get a little grumpy if the pup gets too close to his toys... hee hee! A little lighter on the recipe front this time for us - 7 new recipes for this past week. Being extra choosy, our favorites this go 'round where the Fresh Corn and Basil Tart and those Cheesecake Thumbprints. 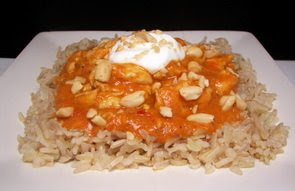 I made quite a few changes to this Spicy Peanut Chicken over Rice as I wanted to amp up the flavors a bit for our dinner tonight. One of the first changes I made was to add a few chicken thighs into the mix, rather than using completely breast meat as the original recipe called for. Besides staying a bit more moist throughout cooking, we both like the depth the darker meat adds in general. Rather than just tossing the tomato paste with a bunch of liquid into the pot, I added it to the cooked chicken meat before any other ingredients so it had a chance to intensify and caramelize. The next change I made was the amount and type of peanut butter - the original called for less and used a chunky commercial version. Because I wanted a creamier texture without any added sweetness, I used our homemade natural peanut butter to amplify the nutty flavor. After seasoning the chicken in the saucepan with curry powder and crushed red pepper, we tossed in chopped plum tomatoes and a bit of chicken broth. After a good half-hour simmer, the sauce had thickened slightly, but was still runny enough to leave you with a generous sauce that yearned to be served over rice. 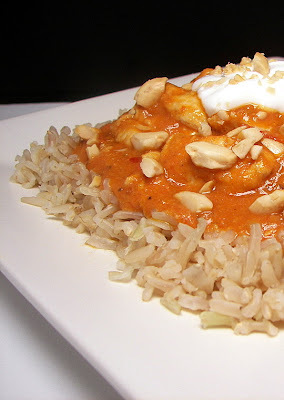 I opted for a bed of brown basmati rice rice using the no-fuss method we've come to rely on. Just for added nutty insurance, we scattered the top with chopped peanuts for crunch. While we did find this a little spicy, it was kind of one-dimensional as the only heat came from the crushed red pepper. We both felt it could have used a little help to ratchet up the spice and while the dollop of thick Greek yogurt on top was cooling, it would have been more beneficial if the heat was there. Other than that, the peanuttiness (is that even a word?) was definitely where we wanted it to be and Jeff and I both agree that the changes we made we needed as it might have been a little lackluster if we strictly followed the recipe. Saturday morning is usually the time I make us a special treat for dessert that will take us a few days to get through. This morning was no different, except for the fact that I'm not sure if it is going to last long enough around here! When I turned around to clean a spatula at the sink, Jeff came quietly around the corner and stuck his finger into this (almost) assembled Creamy Chocolate Dessert - I guess he thought he needed to do his "quality-control" duties (sigh... that just means he gets the piece with a hole in it!). I caught him as I turned around, tapped him with my now clean spatula and noticed he was too busy enjoying the piece he scooped out to care! Humph... at least I didn't have to wait to find out if it was going to turn out well or not. Instead of a graham cracker base, the bottom of this creamy dessert is a mixture of flour, powdery confectioners' sugar, butter and nutty toasted pecans. Once pulsed together in a food processor, this crumbly mixture is pressed down into a baking pan to form the crust. The pan is then slid into the oven long enough for it to melt together and form a solid crust. Once the crust had cooled completely, we started preparing the fillings that will be slathered on top. The first layer is cream cheese that we whipped with confectioners' sugar to add some sweetness. Because it is still a little dense, the cream cheese is lightened with an overstuffed cup of stabilized whipped cream. Stabilized whipped cream ensures that it doesn't weep when it sits around and allows the texture to be a little more firm. You can use a product like Dream Whip to do this, try out a method using gelatin or if you think you won't keep it sitting around long, a mixture of confectioners' sugar and a little extra cornstarch usually works well. If you are looking for an easier method, I won't tell if you use something like Cool Whip instead - you'll need one eight ounce container (which is what the original recipe called for). I don't have anything against it, but we just prefer to taste of real whipped cream. While that layer was chilling out in the refrigerator, I did take some help from the market with the next addition by using a couple packages of instant chocolate pudding mix! The pudding does need to set up a bit before spreading it on, but this is fine as you already have downtime waiting on the first layer to firm up. 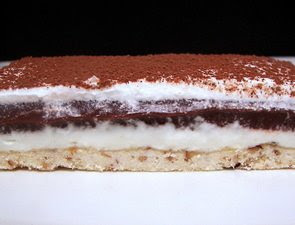 The remaining cream we whipped is the final addition, making this four-layer dessert sing! Just before I served this, I dusted the top with cocoa powder for a pop of color against the final white layer (and who would say no to another dose of chocolate?). Luscious, creamy and soft, without being runny, I didn't find it as easy to get clean slices as we usually try to do. However, scooped into a bowl or a tidy piece on a plate, I don't care how it is served as I'm already thinking it will make a fine breakfast, lunch and dinner! The cream cheese added such a pleasing, clean silky body while the pudding cut through the richness of the whipped cream. And I can't forget about that buttery nut-laced crust on the bottom that added just the right textural contrast to the above layers. 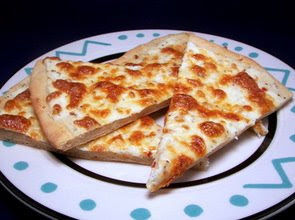 Like a lovely little (and slightly annoying) tune, our food processor was humming along again this Friday evening as I needed to make a batch of our favorite whole-wheat dough to use in this Three-Cheese Pizza Bianca I prepared for dinner. While both of us enjoy pizza loaded with toppings, every now and then it is good to prepare a more innocent pizza by keeping the toppings to a minimum. While the dough was resting and rising, I flavored a tablespoon of oil with a few cloves of minced garlic. This won't take too long and because you want to keep the garlic, do this over medium heat - when the garlic just begins to take on a golden tinge, remove the skillet from the heat and let it cool. That garlicky oil, along with the obligatory salt and pepper, is then stirred into a mound of ricotta cheese. This creamy concoction is dolloped over the top of the stretched pizza dough and spread smooth. I used the twelve-ounce version of the dough for a thinner pizza, but if you want a heftier piece, don't be afraid to up it to the sixteen-ounce recipe. That's only one cheese, right? The other two come in the form of shredded lightly sweet Gruyère and sharp fresh grated Parmesan cheese. Baked until the bottom of the crust is crisp and the cheese on top is molten, bubbling and spotted with golden brown dots, I couldn't wait to let it cool down. So, even though I burned my tongue (I hate that! ), I would do it again for that first bite. As the heat from the oven firmed up the mild ricotta slightly, it also warmed up the oil and garlic, allowing its subtle flavor to permeate through the stronger cheeses on top. You know, a few years ago, pizza was not really a pizza to either of us unless it had a tomato-based sauce on it (hey, what did I know? ), but I've learned my lesson over the past few weeks and am glad to know that pizza can still rock without it. While Gus was off taking some time to relax in his new playpen (yes... he has his own playpen! ), I had enough time to make these Cheesecake Thumbprints Jeff took in this morning for the Treat Day this week. Before you begin working on the dough, you'll want to whip together the creamy cheesecake filling for these cookies. Softened cream cheese, a few tablespoons of granulated sugar, an egg yolk, a touch of sour cream and a few drips of vanilla form this mixture. Right after being mixed together, the filling is quite liquid-y... but a short stint in the refrigerator while you prepare the cookies will allow the mixture to thicken slightly. 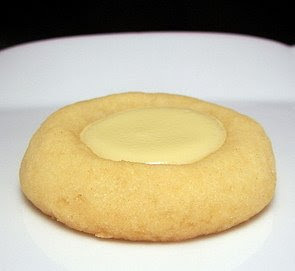 These round gems are a basic shortbread cookie - a combination of flour, unsalted butter and a little sugar. However, an egg yolk is also tossed into the dough to add to their tender melt-in-your mouth quality. The dough should not be too dry, but not too moist either - you should be able to roll them into balls without it sticking to your hands. Once all scooped out, the balls are given a tidy indent in the center by using the thick handle end of a sturdy wooden spoon - so the handle glides through the dough, be sure to give it a light dip in flour before moving to the next cookie. You don't have to worry much about the size as the center will blossom open as the cookies bake. After a few minutes, the cookies need to be removed and the indent re-made as they puff up slightly as they bake. I just used my thumb to press the centers back down, but as the cookies will be quite hot, you can also use that same wooden spoon handle to do this. They go back into the oven until the are just starting to take on a golden hue around the edges. Once the cookies have cooled completely, the open centers are given a dollop of that luscious cheesecake filling and the filled rounds go back into the oven just long enough to set that batter. 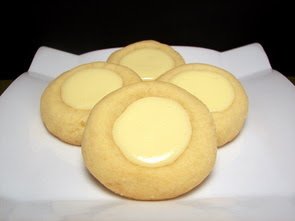 While we very much enjoyed the simplistic flavor of these rich and buttery two-bite buttons, you could add a little citrus note by tossing in some fresh grated zest into the cookie dough or even into the cheesecake filling. We taste-tested these last night only after a couple hours and the flavor was nice, but if you let them chill out in the refrigerator like you would a regular cheesecake, the flavor does bloom a bit more and the cookies really shined when we had one during breakfast! 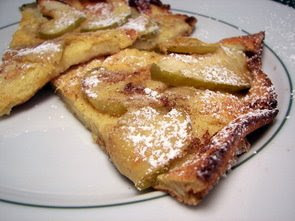 This German Apple Pancake we had for dinner tonight was quite interesting! Now, I'm not saying that in a bad way, but it was just a little different than I was expecting. You'll need to plan ahead if this baked pancake piques your interest as the batter needs to rest for roughly half an hour before using it. While the vanilla-scented batter is not too unusual, it does have quite a high proportion of eggs in it. As the batter was resting, we forged ahead with the recipe by dusting one of our larger skillets with a combination of granulated sugar, cinnamon and nutmeg. We then laid down thinly sliced Granny Smith apples in a circular pattern around the bottom, completely covering it. The original recipe has you just sprinkle additional granulated sugar on top, but why not take advantage of adding a little more flavor? Instead of splitting the half cup of sugar and spicing up one-half as the recipe stated, we increased the amount of the sweet spices and used that to dust the skillet and then top off the apples. Before pouring the pancake batter on top, the apples and sugar are first heated, allowing the apples to soften slightly and let the sugar begin to turn into a sweet caramel-esque syrup. 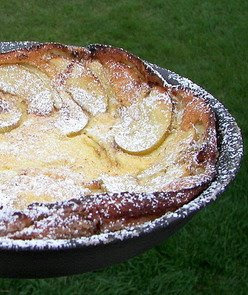 Be gently as you pour the batter into the skillet as the apples will have a tendency to move around if you add it too fast. The whole shebang is slid into the oven and will cook until the pancake is quite puffy in the center and the edges burst up and slightly out the sides of the skillet. Because of that sticky syrup that formed on the bottom, you will need to give the pancake a nudge or two with a spatula to gently cajole it out of the skillet. We both commented on how we liked that the apples were fork tender, yet not mushy - what we weren't expecting was how "egg-y" tasting the pancake was. It wasn't as intense of a flavor like you would find in a frittata or anything, but it was fairly pronounced. While the center was completely cooked, I found the texture to be more moist and dense like a set-custard rather than a lighter pancake. Jeff's favorite part was the crispy, golden sweet edges that had a little crunch from the extra granulated sugar. Served with an adornment of confectioners' sugar, there is no maple syrup needed as that caramelized sugar on the bottom brought that needed layer of flavor. Different texture (at least to us) for sure, but it still tasted good! In anticipation of Gus's arrival this week, I planned ahead and chose recipes for the remainder of the week that didn't take much effort to maximize puppy playing time! While tonight's dinner, Baked Gnocchi with Spinach and Ricotta, took awhile to bake, it just took a few minutes to throw into the baking dish. 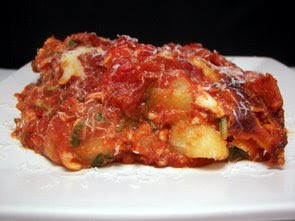 You could basically think of this as a lasagna, except the gnocchi stand in for the sheets of pasta. I used some homemade marinara that I've had in the freezer from quite awhile ago (almost time to get more going! ), but feel free to use whatever red sauce you like - a meaty batch would work well here too. Do note that the packaged gnocchi are added without being boiled first - since a generous amount of sauce is used, there is plenty of moisture for them to drink in as they bake. In between the layers of sauce, tender baby spinach leaves and gnocchi are dollops of a three-cheese blend of ricotta, mozzarella and fresh grated Asiago cheese. I love the assertive nature of Asiago, but you can always swap that out for Parmesan if that's what you have. I use those two interchangeably often, but I know not everyone may like its flavor. Fresh basil leaves are also added, along with a pinch of crushed red pepper and an egg to add a little puff as the heat from the oven warms the dish through. The gnocchi transformed from their firm potato-y selves into soft, pillowy nuggets that tightened up the dish well. 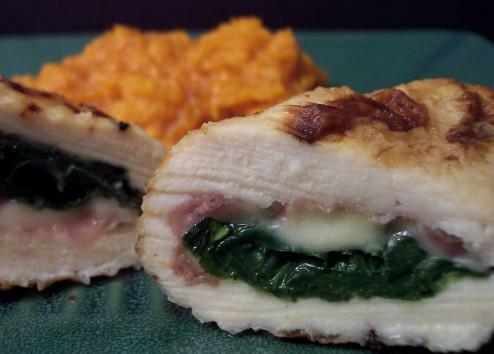 Those creamy pockets of cheese were a delight to find and added a needed richness. If you can wait long enough for it to cool down some, I think this dish might even hold its shape when you portion it out, but we were ravenous and didn't care to push it! And lest we forget, I did get the baking done for the Weekly Wednesday (I mean Thursday... at least this week!) Treat Day. We didn't get a chance to take pictures yet, so I'll get those done and slip them into tomorrow's post. 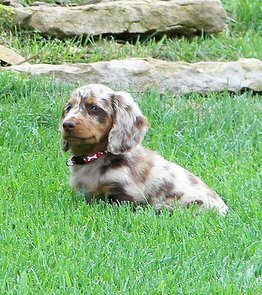 We are very happy to let you in on a little secret... we went and picked up a little guy we have been waiting for awhile now - meet our new little daschund, Gus! 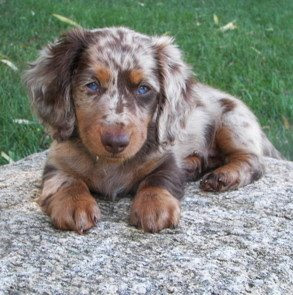 He is a long-haired chocolate dapple. Warning - be prepared for lots of pictures! 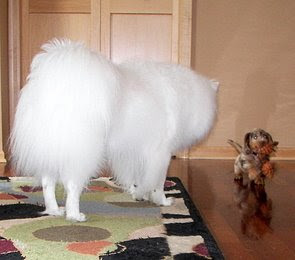 Needless to say, we'll be too busy playin' around with new squeaky toys and seeing how his older brother Max adapts to this interesting creature invading his home, rather than making dinner tonight. Doesn't Gus look like a toy himself? I will, however, be making a treat for Jeff to bring in for treat day, but it will be pushed back to Thursday this week! 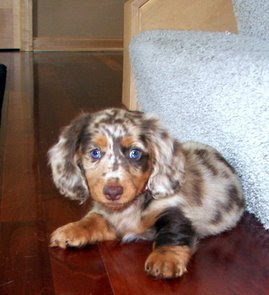 Jeff has longed for a daschund and we had been tossing the idea around of getting one for quite some time. However, with Spike's passing a few months ago, we decided we wanted to wait until we both felt ready and the time has come for a new adventure! So far, he's been getting used to his new kennel, tromping around outside and gobbling up his food... ahh the life of a puppy! 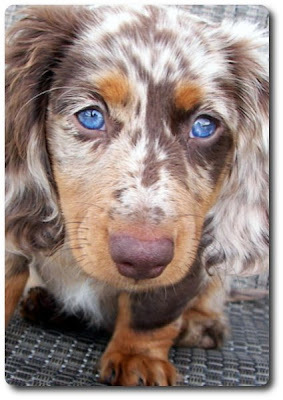 We were pulled to this pup because of his outrageous looking coat and his laid back temperament - he also has gorgeous light blue eyes that will melt your heart! Uh oh... I think he spotted a bunny - time to go run and catch him! Good exercise for all of us! Eggs on toast... err I mean pizza!